A few years ago we cooked up our own pig on the big grill. 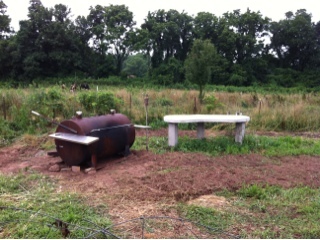 The grill is home made, from parts found on the farm. It was placed inside the fence around the garden, and then the cement table was cast in place. Claire told Homer she wanted to work with cement, and this table, large enough to hold the big cuts of pork coming off the grill, was the result. When it came time to move pens through there, the grill was just a bit too close to the fence. The pens could get to a certain point but then would be stuck, and stuff grew too high. And after a few years of use we discovered that the distance between the table and the grill was a little too far, that the many steps needed were more than made sense. Relocated the other day the closing of the gap now allows for easier handling of hot, heavy and slippery chunks of meat. And the pens can now make a complete, full pass in the area, allowing for easy maintenance. A few inches makes all the difference!